The new Leaf is just the start of Nissan’s battle for EV supremacy. It’s safe to say we were pleasantly surprised by the reveal of the . While its 150-mile range still leaves it languishing behind some of its rivals, it makes up for this drawback with advanced self-driving features, an , and an attractive price that significantly undercuts the Tesla Model 3. The new Leaf is just the start of Nissan’s battle for EV supremacy, however. We already know that the automaker is to take on the Tesla Model X and the upcoming , but has now revealed we can expect to see it debut at this year’s Tokyo Motor Show in October. Riding on the same platform as the new Leaf, has learned that Nissan’s new electric SUV, which isn’t expected to share the Leaf name, will be “a little bigger” than the Nissan Qashqai, which is powered by conventional gas and diesel engines. It’s part of Nissan’s plan for 20 percent of its sales to be EVs. The new Leaf’s platform has been built with adaptability in mind, and is said to be much lighter and stronger than the old Leaf’s chassis. In the future, it could also be applied to an electric Nissan sedan. 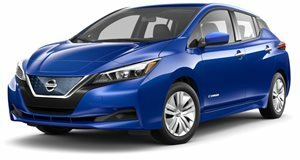 Nissan’s new fleet of EVs are expected to use the same 40kWh motor as the new Leaf, and will offer a range of around 235 miles. The Leaf’s ProPilot and Priopilot Park autonomous technologies could also make it into Nissan’s electric SUV, as well as the e-Pedal. As for a name, Nissan recently filed a trademark for the Terra which was used for a Juke-style electric SUV concept shown at the 2012 Paris designed to preview an upcoming production vehicle, but company executives confirmed that this will not be the car debuting at the Tokyo Motor Show.